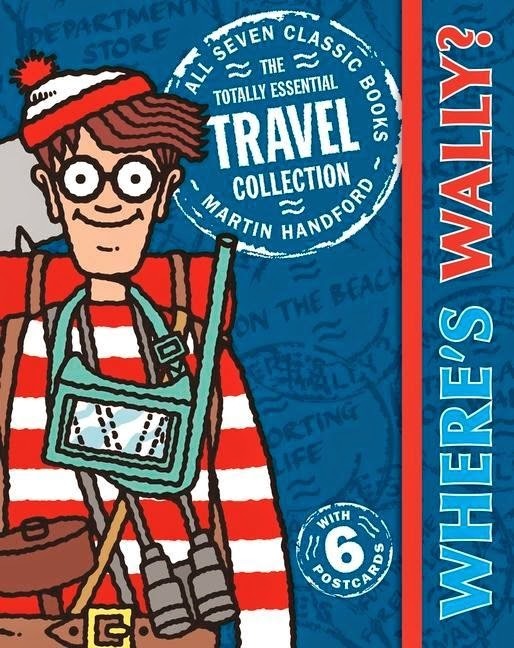 This Where’s Wally collection is a fantastic travel companion for any age. All seven classic adventures are here together in one book to entertain, challenge, and occupy the mind during short or long journeys. It invites readers to begin by finding Woof, Wenda, Wizard Whitebeard and Odlaw, also twenty-five Wally watchers hidden amongst the crowds.There are hours of search-and-find occupation, and at the beginning of each adventure, is a checklist on a fold-out page. The covers hide six fantastic postcards to use or keep. Wally is setting out on a worldwide hike equipped with all his gear. From beaches to ski slopes, camp sites to railway stations, and through different eras all over the world, there are new things to find and learn about. Adventures with invisible monks, unfriendly giants, gobbling gluttons, carpet flyers, nasty nasties, and lots more ghoul to drool about and enjoy, fill every page. From the bottom of the sea to the underground, and from the Land of Wallies to Hollywood, try searching each scene with a magnifying glass to find all the hidden things that can sometimes be missed. At the end of the journey the party/celebrations begin. Flags of 18 countries are flying. Six flags have something wrong. Have fun finding what it is. New and old Wally fans of all ages will have a terrific time with this flexible compact book. No one will say ‘I’m bored’ with this in their lap.